Get off the elevators at McCann Erickson’s headquarters in Midtown Manhattan, and you might have to do a double take. 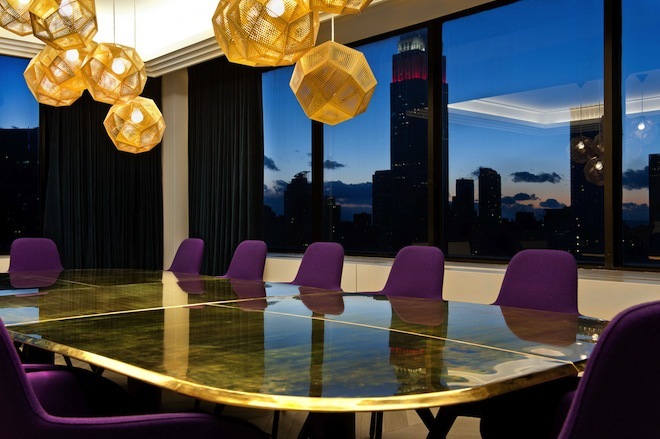 At first glance, the advertising agency’s 27th-floor space looks more club than office, which is actually both a compliment to its gorgeous interiors and a testament to the space’s ability to draw you in. When you walk through the double doors, you’re greeted by a shiny, geometric reception desk that doubles as a spaceship-like seating area. This twisted piece of milled aluminum, named the Control Tower for its control center functionality, is striking, but it’s only the first conversation piece you’ll find on the executive floor of the 130,000-square-foot office. The unexpected design moments are courtesy of Tom Dixon’sDesign Research Studio, the interior and architecture branch of the London design studio. Together with architecture firm Gensler, Dixon and his team of designers transformed McCann’s formerly stodgy, cubical land into a stylish, open-plan office. The goal: To design a workplace without barriers that still felt personalized and private. In other words, the two firms wanted to create a totally modern office. Strauss points out that we work a lot differently today than we did even five years ago. As tablets, smartphones and laptops replace the traditional desktop computer setup, our workspaces need to reflect that increased desire for flexibility. “We’re much more mobile now and the conventional way of working in a cubicle is very much out of date,” he explains. “It’s all about a flexible work environment where you can move around, you can choose where you want to work.” On the executive floor of the McCann offices, there’s the lounge, a communal space outfitted with blue leather diner-style banquettes that acts simultaneously as a space for eating, working and meeting. 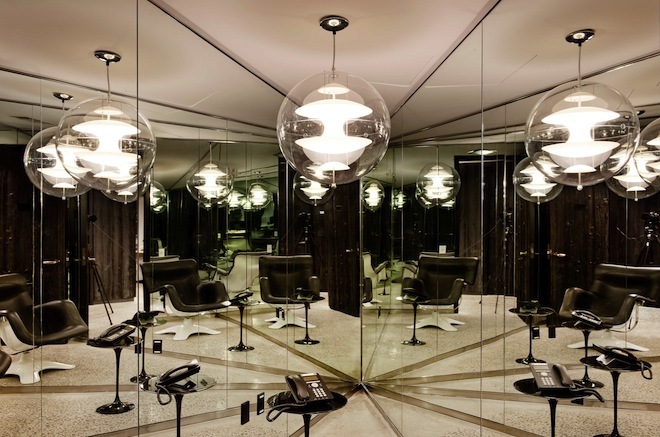 There are also a total of nine breakout spaces, including a tiny, geometric phone room outfitted in mirrors, where people can make private calls. There’s The Apartment, which houses human resources and has a domestic feeling with rosewood veneer and soft upholstery. The Science Lab, home to the finance and legal department, makes use of monochromatic colors and shiny, metal surfaces. Central Park, home to analysts and strategists, has living walls and embraces clean, natural materials, which is meant to fascinate clear thinking. Then there’s the Library, where all of the high-level executives sit, which requires décor that is much more traditional. These aesthetic divisions give employees a sense of ownership over their space, but Strauss says the also encourages people to branch out and find areas that suit their needs at that exact moment. When you walk into the McCann offices, you’ll find yourself in the Broadcast Center, which houses the twisted aluminum reception desk. The walls are outfitted with screens displaying some of McCann’s most famous advertising work, and a series of televisions flicker on silent to make sure breaking news is caught as soon as possible. If you judged the office by this scene alone, you’d figure the entire work space would be a fairly obvious display of technology. But Strauss says inundating the reception area with splashy technology was intentional; other areas of the office integrated technology much more subtly. As tablets replace the traditional desktop computer, our workspaces need to reflect that increased flexibility.